The recent U.S. Supreme Court decisions in Parents Involved in Community Schools v. Seattle School District No. 1 and Meredith v. Jefferson County (Ky.) Board of Education have focused renewed attention on the racial and ethnic composition of the nation’s public schools. The past 15 years have been a period of considerable change in both the demographics and infrastructure of the public schools. According to Census Bureau data, school enrollment (public and private) reached an all-time high in October 2005 at about 50 million students (Census Bureau, 2005). To accommodate growing enrollments, many school districts have opened new schools. The total number of public schools has increased by more than 13,000 schools — to nearly 94,000 — since its 20th-century low in 1988-89. At the same time, high levels of immigration have resulted in considerable growth in minority student populations, while white public school enrollments have modestly declined since 1993. 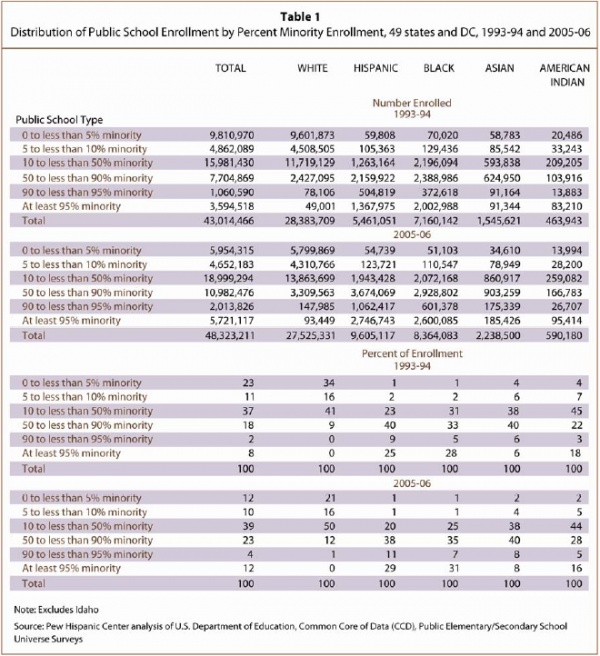 This report provides the most up-to-date snapshot available of the ethnic and racial composition of the public schools educating the nation’s pre-kindergarten through 12th-grade students; it also compares this 2005-06 portrait with the same portrait taken in the 1993-94 school year. The analysis is based on public school enrollment data published in the U.S. Department of Education’s Common Core of Data. These data derive from an annual census (as opposed to a sample) of the nation’s public schools (NCES, 2007a).2 The 2005-06 school year is the most recent one for which data are available; the 1993-94 school year is the first for which nearly every state reported public school enrollment by race and ethnicity. Thus, those two school years serve as the comparative points for the analysis. The number of nearly all-white public schools fell from 25,603 in 1993-94 to 16,769 in 2005-06. Although the total number of white public school students in 2005-06 is roughly the same (at 28 million) as in 1993-94, the racial and ethnic composition of public schools educating white children significantly changed. There are 35% fewer nearly all-white public schools (schools in which fewer than 5% of the students are non-white) now than before, and white enrollment in nearly all-white schools has declined significantly, both in absolute numbers and in percentage terms. Nearly 4 million fewer white students attended nearly all-white schools in 2005-06 than in 1993-94 (Table 1). More than a third of white students attended nearly all-white schools in 1993-94, while in 2005-06 just one-fifth of white students attended nearly all-white schools. Though very few white students are educated in heavily minority schools, fewer white students attend nearly all-white schools and thus white exposure to black, Hispanic and Asian students has increased. While white students became less isolated from minority students since 1993-94, the growing minority student populations have become slightly more isolated from their white peers over the same period. In 1993-94, 34% of Hispanic students and 33% of black students attended a public school with at least 90% minority student enrollment. In 2005-06, 40% of Hispanic students and 38% of black students were educated in such heavily minority schools. The share of Asian students educated in schools with at least 90% minority student enrollment increased from 12% in 1993-94 to 16% in 2005-06. Though fewer white students attend nearly all-white schools, it continues to be the case that a very large segment of the nation’s black and Hispanic students have little exposure to white students. In 2005-06, nearly one-in-three Hispanic and black students was educated in a public school that was nearly all-minority (a school in which fewer than 5% of the students are white). These schools educated almost none (less than 0.5%) of the nation’s white students.